Associated Press Colorado Avalanche center Nathan MacKinnon, front, fires a shot at Nashville Predators goaltender Pekka Rinne for a goal in the second period of Game 3 of an NHL hockey first-round playoff series Monday, April 16, 2018, in Denver. 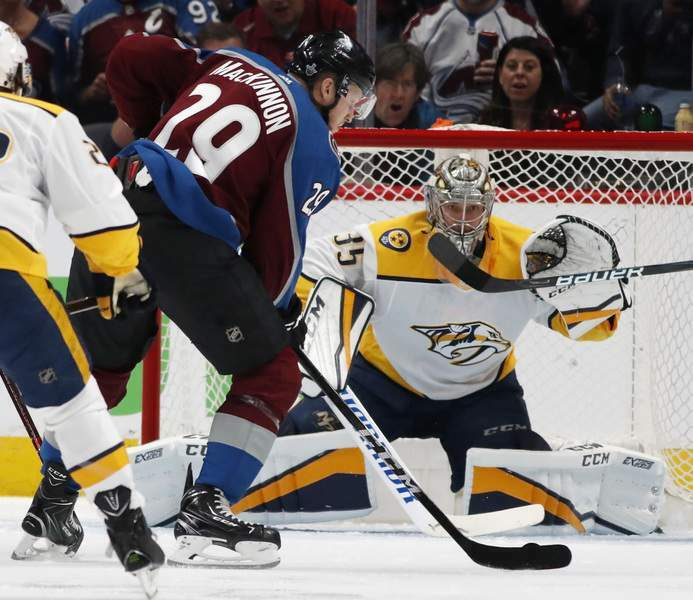 DENVER – Nathan MacKinnon scored twice, including one as part of a three-goal first period and another to chase Nashville goaltender Pekka Rinne from the game, and the Colorado Avalanche held off the Predators 5-3 in Game 3 on Monday night to pull to 2-1 in the first-round series. For a third straight game in the series, Colorado scored first. This time, the Avs were able to make it hold up. MacKinnon and his teammates have been a different bunch at home this year. Their 28 home wins in the regular season was tied for the most in franchise history with the 2000-01 squad that hoisted the Stanley Cup. MacKinnon's goal at 4:25 of the second period gave Colorado a 4-0 lead and prompted the Predators to pull Rinne in favor of backup Juuse Saros. Rinne allowed four goals on 15 shots. Jonathan Bernier stopped 29 shots on a night when the Avalanche finished 0 for 5 on the power play. Ryan Johansen had a second-period goal and Colton Sissons scored another in the third to make it 4-2. Saros was pulled for an extra skater with around 2:20 left and, moments later, Landeskog was credited with a goal after being dragged down on a breakaway. A sliding Landeskog was trying to get the puck over to MacKinnon. Austin Watson scored late to make it 5-3 and led to a tense final minute. It didn't take long for Colorado to get on the board with Comeau scoring 1:50 into the game and on the team's second shot. Another torrid start as the Avs beat Rinne on their opening shot in each of the first two games. Shortly after Bourque tipped in Patrik Nemeth's shot, MacKinnon scored with 1:53 remaining in the first when he took a pass from Landeskog, used a burst of speed to get free and beat Rinne with a wrist shot. MacKinnon led the league in home scoring in the regular season with 67 points. NOTES: Nashville LW Viktor Arvidsson nearly had a goal in the first when he and the puck crashed into Bernier at the same time. The puck slid in, but the officials waved off the goal due to goaltender interference. ... A Nashville fan threw a catfish onto the ice. ... Avs D Samuel Girard missed a second straight game with an upper-body injury. ... D Nikita Zadorov celebrated his 23rd birthday. ... Broncos LB Von Miller showed up wearing a No. 58 Avalanche jersey.